With construction underway to create the state-of-the-art Don Constantini Multimedia Center, the Youngstown State Department Intercollegiate of Athletics has announced that the East Side seating sections of Stambaugh Stadium will be closed for the upcoming 2018 campaign. 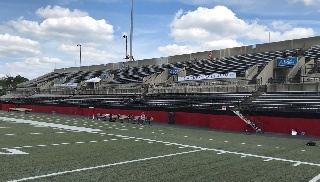 The East Side has been the home of the YSU Marching Pride, YSU students and select season-ticket holders since it opened in the fall of 1997. Upon completion of the Constantini Center this spring, the side will be open for the 2019 campaign. All fans who normally reside in those seats will be moved to the West Side of the Complex this fall. The Marching Pride will be in Section 1 while the YSU students will be in Second 2. Once again tickets for all YSU students are free and can be picked up at the YSU Bookstore or the Athletics Ticket Office. There will be no parking on the grass behind the East Side, an area that is normally reserved for handicapped parking. This year, handicapped permits will be honored at the M-30 and M-60 decks and fans can take shuttles to the stadium starting 90 minutes prior to kickoff. The shuttles will be available during and after all games.